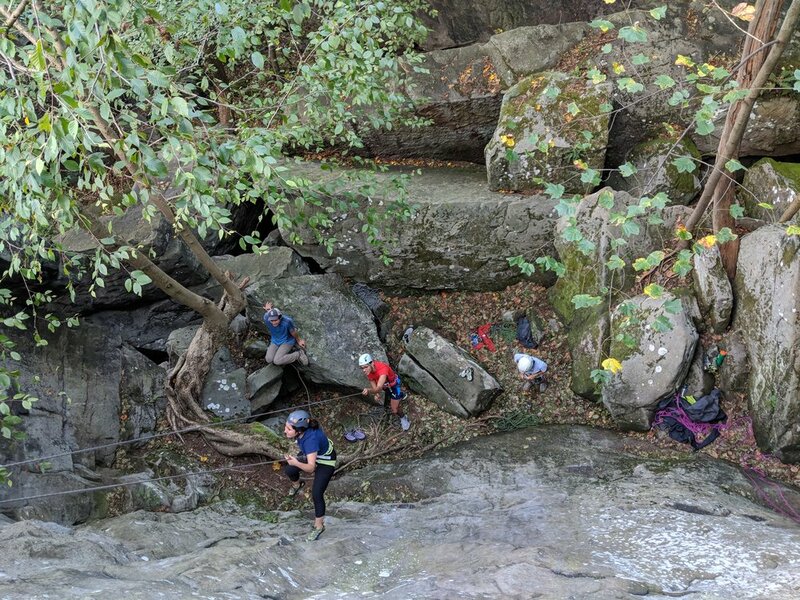 The Sunday after the Ohiopyle camping trip, sixteen new Explorers and three officers ventured to Breakneck to try their hand at rock climbing and belaying. For many, this was their first time climbing outdoors - and for some, their first time climbing at all! After a brief intro on crag ethics at the trailhead (Leave No Trace, be respectful of other climbers, be safe), the group hiked up to Breakneck Rocks, where we set up topropes on Fools Gold (5.9), Nemosis (5.9), Bio Fear (5.8), and the classic Eclipse (5.6), while working to stay out of the way of other groups. Everyone in the group learned to tie in using a figure 8 followthrough, and belay with an ATC or a GriGri, as well as properly put on a harness and helmet. By the end of the day, everyone was proficient at the technical skills, and able to focus on the fun stuff - climbing! As many discovered, climbing outdoors can be pretty different from the gym - the lack of distinct holds leads to a lot of creativity in routes taken to the top! Everyone went home tired, but ready for more.